Join the Thursday Night Soup Club! Do you love soup? You’re in the right place! 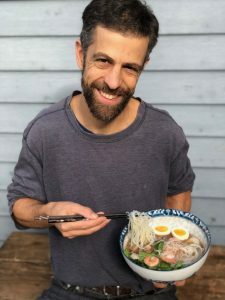 The Thursday Night Soup Club is my FREE weekly newsletter where I share soup recipes from around the world, how-to videos, digestive health tips, tips to simplify cooking and meal prep and all sorts of cool stuff that will help you make soup-making more healthy, creative and fun. Hi there! I’m Craig Fear, and I’m a total broth and soup fanatic. I can’t get enough of them. I make them at home. I teach others to make them. I photograph them. I collect cookbooks about them. I write cookbooks about them. I even travel for them! You can learn more about my journey here. When you sign up for the Thursday Night Soup Club, you’ll join a community of like-minded foodies, soup lovers and health-conscious folks. Besides great recipes delivered every week, you’ll also get tips and strategies for overcoming many common gut problems using broths and soups that contain restorative and medicinal qualities. Finally, I’m always working on something new—a new book, an online program, an in-person cooking class, etc. As a newsletter subscriber you’ll get special discounts, coupons and offers on all of my products. I look forward to having you in the club. Soup lovers unite!